This year we are moved to a five day specials rotation. That means, I will get to see your children every week! I'm excited to get to spend more time with your kids and do even more fun activities and experiments! Let the fun begin! We have been super busy in Design and Innovation! Sometimes I don't post as much on the blog, but keep checking my twitter feed for daily pictures of the adventures the kids are having! 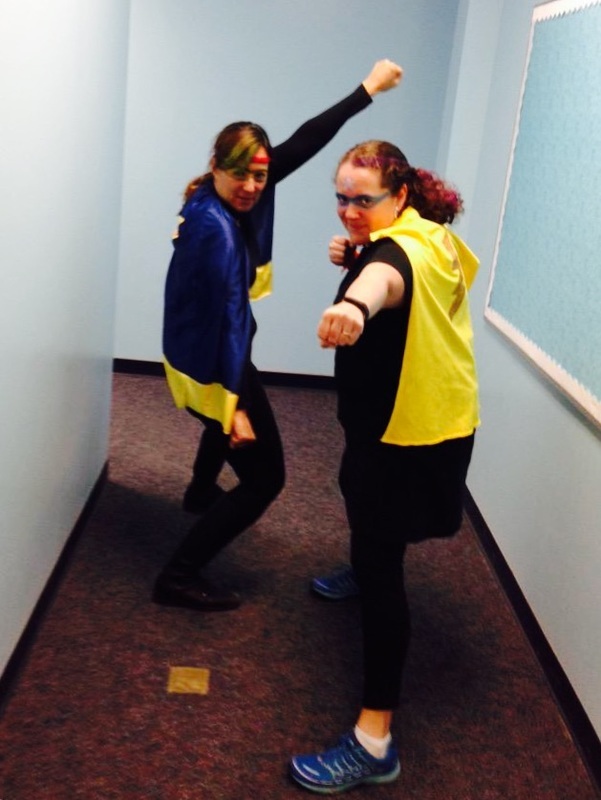 Today many students and teacher showed their school spirit by dressing up as Super Heroes. 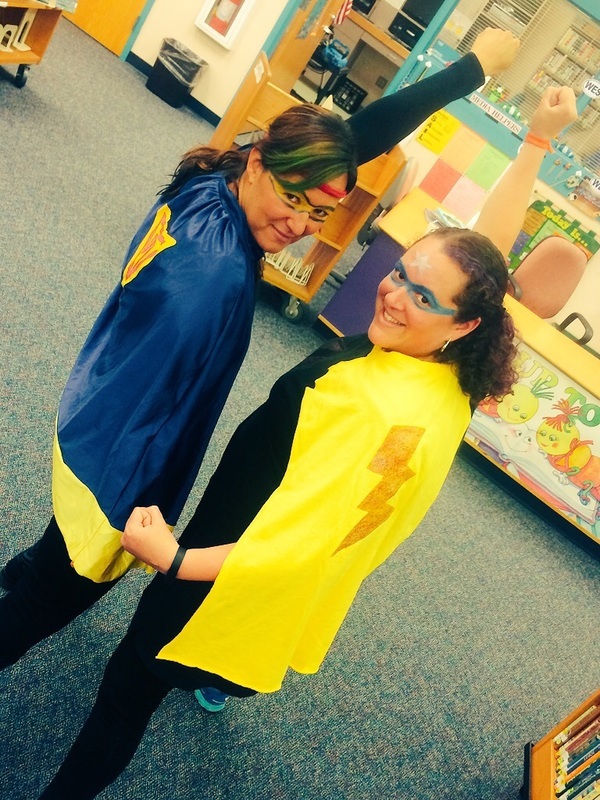 Mrs. Rollin (the art teacher) and I had a lot of fun zooming around watching for students who were being aWESome! Fourth and fifth grade have been working on beginning typing skills. They are welcome to practice at home! Or, if you don't have a computer at home, the public libraries have computers you can use for free. This week we are focusing on using laptops in the STEM lab. The kids are having fun using technology to build new skills! In Kindergarten and First grades, the students are working on typing in their lunch number and learning how to get to this website. There they are finding the pages I have on the "Links" page. Finally, they are working on using a laptop mouse pad to create cars, faces, cakes, and houses. You kids are welcome to continue practicing at home! 2nd grade is using an animation site to create a short movie. They have to create each slide, so when it is all played it moves like a short film. We are centering our "short films" on weather, which they are currently studying in their classroom. 3rd grade will be learning all about vermi-composting! They will be using a site called Vermi the Worm to learn about how to care for worms, how important they are to the soil, and more about composting! This connects with their "plants" science unit! Finally, Forth and Fifth grades are working on beginning typing! 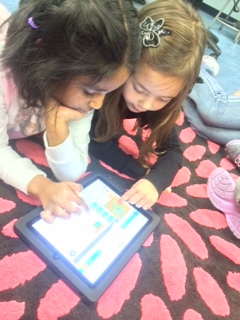 They are learning the basics of the "home keys" and using a fun game to familiarize themselves with typing. I'm hoping to lessen the hunt and peck method so many of them use! Each of the sites we are using can be found under the "LINKS" page above. I encourage you to have your child practice and share these with you! Having tons of fun on our Make Up Days!!!! Those who are out are missing tons of fun around the building! In STEM we are building straw rockets, coding, creating cages for hexbugs and much much more! Check out the pictures on twitter! After attending a workshop by code.org, I decided to jump back into coding again this week. 2nd -5th have been collaborating with a partner to create their own games, while the younger grades have been using Angry Birds to better understand how to build code, using blockly. All kids have had a blast working on computer science this week! We are building the knowledge of several future computer scientists! Kindergarten and Second grades have been visiting the worms! We have learned so many new things! 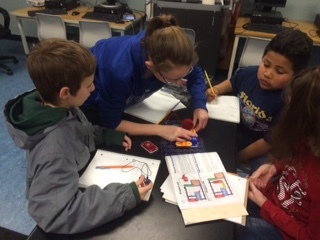 Fourth grade studied circuits in their science class. In STEM, we have tried to take it even further with our snap circuit kits. The kids have been working together to understand closed/open circuits, make things light up, and even make a small machine that plays a birthday song!